Many furniture retailers will add steep delivery charges for large items of furniture but most of the beds, mattresses and furniture on offer here will qualify for free delivery, so there is no need to factor in expensive delivery costs when you are choosing your new bedroom furnishings. Where do I use my Dreams voucher code? Select a deal from NetVoucherCodes and follow our link to dreams.co.uk. Click ‘Checkout securely’ to continue with your order. Sign in or create a new account then enter your delivery details. Choose a suitable delivery date and enter your payment details. "Free delivery on all orders over £100." "Interest-free credit with 0% APR." Dreams sell hundreds of beds in a variety of materials like wood and metal, plus a range of styles like divan, adjustable and storage as well as sofa beds, folding beds, and bunk beds. All these options come with a mattress, either memory foam or sprung, free delivery, assembly service and a recycling service of your old bed. Dreams offer a lowest price guarantee so you can be confident that you're getting the best value when buying your bed. And, if you use our voucher codes before you buy you can enjoy an even lower price with extra savings at the checkout. Choose your bed frame from Dreams based on size, style, brand, and colour. There are small single, single, small double, double, king sized and super king sized bed frames available in the range at Dreams from big name brands such as Wiemann, Dreams and the Original Bedstead Company. A bed frame is the main focus of your bedroom so you need to make sure it looks the best and is of the highest quality. At Dreams you get both of these essentials guaranteed; all beds are made with the finest, sturdiest materials that are both long lasting and attractive. All bed frames are also extremely affordable especially when coupled with our money saving voucher codes and offers for Dreams. If you have more than one child, why not choose a bunk bed when kitting out their room? Bunk beds are real space savers and make going to sleep more fun! Dreams’ range of bunk beds is extremely diverse; offering something for children of all ages. There’s a variety of sizes to fit all rooms and ages of children, there are also different designs used to comply with all tastes and to make your kid’s bed a fun place to be, where they can let their imagination run away with them. There are different styles of bunk beds available such as cabin beds and high sleepers where you can horde mountains of toys and utilise storage space to the best of your ability. Some beds even come with built-in desks where your little ones can do their homework. Dreams ensure that their bunk beds not only look good and save space but that they're also comfy and safe, as they know a good night sleep is the most important aspect of any bed. Get the best value for money on bunk beds at Dreams by using our voucher codes and deals found above. A good night sleep is crucial for your general health and well-being, which is exactly why you need a comfortable bed. Dreams make all their products based on this very requirement to ensure they supply you with the best beds that’ll guarantee a good night’s sleep. Dreams offer a huge range of beds including single beds - perfect for young kids and smaller bedrooms. Choose your single bed based on its features such as comfort grade, colour, spring count and finish, once you’ve hand-picked your ideal bed get it delivered straight to your home and enjoy a free assembly service and recycling of your old bed. Discover your ideal material whether that be painted wood, hardwood, solid oak, light wood or walnut effect wood while you search for your single bed and combine all these preferences to find a bed frame that’s both stylish, comfortable and affordable that suits your needs and room space perfectly. Shop via price to ensure the bed you like is in your price range and enjoy more discounts on your order with our voucher codes and deals which can help save you big money at the checkout. How can I find my nearest Dreams store? To find your nearest Dreams store please use the store finder. Please ensure that you have checked your junk and spam folders for the email first. If it's not there please contact Dreams. To contact Dreams please call 0800 652 5090. If you want to cancel your order you need to contact Dreams first. Please note that cancellation charges will apply. Dreams are a leading, popular British bed retailer that provides everything you need for a perfect night’s sleep. 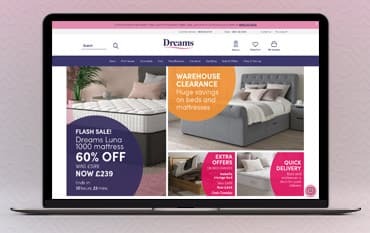 Dreams sell a range of beds, mattresses, headboards, furniture, and bedding from several big brands, including their own, with free, fast UK delivery. Snap up one of our fantastic Dreams voucher codes and get a great discount on your bed. Before you buy from Dreams make sure you check out our voucher codes and deals to ensure that you buy your purchase for the best price possible. We are constantly on the hunt for first order Voucher Codes for Dreams to help you with your money saving. Our experts check dozens of sites for secret codes including NHS discounts, student sites & social media channels saving you time & money!